Home » For Retainers » Retainer Brite Tablets - Invisalign and Retainer Cleaner » Retainer Brite 1 Year Supply 384 Tablets - ON SALE! Your lowest price for Retainer Brite on the Web is here at DentaKit.com! You don't pay sales tax unless you live in California! These effervescent cleaning tablets are safe for cleaning clear Essix retainers and clear Invisalign orthodontic aligners, plastic and wire Hawley retainers and appliances, mouthguards, nightguards, bruxism appliances, Valplast Partials, and TMJ splints. Retainer Brite is not sold in local stores, but is available here on our website. Watch the video. Retainer Brite's formula is now more environmentally friendly per new FDA regulations! Depending on the water in your municipality, the formula might not change from blue to clear after 15 minutes, but it does not affect the way that Retainer Brite cleans your dental appliance. Also, in case you're wondering, last year the box was changed from purple-and-white to plain white. This year it was changed back to purple-and-white (the tablets inside are the new formula). Don't be fooled by cheap sellers on Amazon and eBay who carry expired, old, and counterfeit products -- DentaKit.com's Retainer Brite tablets are always factory fresh direct from the manufacturer! Each one year supply of Retainer Brite 384 Tablets comes with TWO Free items: A FREE Purple Soaking Cup AND a FREE Trimline Retainer Case (a $3.99 value). Use the Free Purple Soaking Cup to soak your retainer in Retainer Brite, then use the Free Retainer Case to safely store your retainers or aligner trays at work, school or home. Retainer Brite is a great cleaner that gets rid of odors, dissolves light plaque buildup, and prevents new plaque buildup! It keeps your retainer bright and shiny. You are left with clean, fresh-smelling appliances! (Please note, if your dental appliance has heavy old plaque buildup, we recommend using SonicBrite or DentaSoak instead. Retainer Brite will not remove heavy plaque buildup). Retainer Brite is specially formulated with gentle cleaning agents and the proper PH that will not yellow or harshly affect removable plastic appliances (this is how it differs from denture tablets). It's the perfect solution for clear plastic retainers and aligners -- no more scratches, yellowing, or cloudy devices! Retainer Brite keeps them crystal clear and good as new, dissolving old plaque buildup and preventing new plaque buildup. Retainer Brite keeps them crystal clear and good as new! Want even more cleaning power? Super charge your Retainer Brite tablets with our mighty little battery-operated Sonic Cleaner! This portable device is only 4 inches square, but delivers an impressive 5800 waves per second, deep cleaning where brushes can't reach. It's a great tool to help motivate kids and teenagers to clean and wear their retainers! Please note: The Sonic Cleaner is sold separately. It is not included with the Retainer Brite. Each one year supply contains 384 individually foil wrapped tablets, one soaking cup and one snap-lock retainer case. For an even better value, consider getting two one-year supplies of Retainer Brite and take advantage of FREE SHIPPING when you use our FREESHIP69 coupon at checkout. Retainer Brite has a shelf life of several years, so you and your family will always have enough on hand! Please note that Retainer Brite is not recommended for appliances with metal solder points. Retainer Brite is not meant to clean dentures or partials; it is only meant to clean retainers and oral appliances that do not contain artificial teeth. Each box of Retainer Brite bears our DentaKit.com sticker for easy re-ordering. Invisalign® is a registered trademark of Align Technology, Inc. Vivera, Denta Brite and Denta Bright are registered trademarks. Retainer Brite is not sold at Target, Walmart, CVS, Walgreens, Rite Aid, or Kmart. It is only available online at DentaKit.com. Each 3-month supply contains 96 individually wrapped tablets. Includes a FREE purple soaking cup. Retainer Brite is not sold in local stores. In case you're wondering, last year the box was changed from purple-and-white to plain white. This year it was changed back to purple-and-white (the tablets inside have the new formula). For best results, use it every day to prevent white plaque buildup. Not meant for dentures or partials that have artificial teeth. Safe for all types of appliances (Invisalign aligners, Essix Retainers, Hawley Retainers, mouth guards, night guards, etc). Not recommended for appliances which contain metal solder. Instructions: Drop one Retainer Brite tablet into enough warm (not hot) water to cover your appliance. Place your appliance into the bubbling blue solution. Remove your appliance after 15 to 20 minutes (the water will NOT turn clear). Rinse your appliance and hands thoroughly with clean running water. Do not soak your appliance longer than 20 minutes. 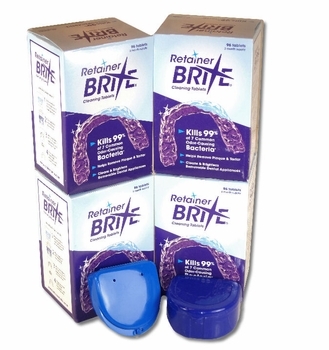 Retainer Brite is one of the most convenient ways to clean your retainer or aligner. It was developed for clear Essix retainers, but can clean a Hawley retainer, and Invisalign aligner, or any type of removable oral appliance or mouthguard. It's great for everyday cleaning. But if your retainer already has a lot of white plaque buildup, we recommend instead SonicBrite or DentaSoak. Retainer Brite won't remove the white plaque buildup, but the other two products will, after several soakings. If your retainer is new or doesn't have any white plaque buildup, then Retainer Brite will do a great job keeping it clean -- as long as you use it every day! Retainer Brite is especially convenient for travel, because you can just throw some of the tablets into your suitcase or purse and clean your dental appliance easily in your hotel room in any type of cup with warm water. If your retainer or appliance contains metal solder, we do not recommend that you use Retainer Brite, because over time, soaking will crumble the solder. Metal solder looks like a silver blob that joins a piece of metal to your appliance. If you're not sure whether your appliance contains metal solder, please ask your dentist or your orthodontist. The box looks different. Is this still the same Retainer Brite that I used to buy? Is a different company making it now?
. Thanks for asking, Claudia! Retainer Brite is still being made by the same company as before. The manufacturer changed the packaging and the formula at the end of last year.Â New FDA regulations required them to change one minor ingredient in the formula that turns the water from blue to clear. This change makes the product more environmentally friendly. Depending on the water in your municipality, the product may take as long as 2 hours to change from blue to clear. Your retainer is still clean and germ-free in 15 to 20 minutes, no matter what color the water is. The water color is just a visual indicator to remind you that your device should be removed after 15 to 20 minutes, and does not affect the cleaning efficacy or cleaning time in any way. So yes, although the box looks different and the water no longer turns clear after your dental appliance is clean, it's still the same great Retainer Brite that you have always used! Can i use retainer brite on a metal retainer ? Thanks for your question, Kayla! You can use Retainer Brite on a retainer or appliance that contains metal, as long as there is no METAL SOLDER on the appliance. If you are not sure whether your appliance contains metal solder, please ask your dentist or orthodontist. Why can't you use Retainer Brite with an appliance containing metal solder? Simple: over time it will eat away at the solder (turning it black) and eventually the solder will crumble off. Often dental appliances are made with soldered pieces which are considered optional and are not really needed to retain your teeth properly. If your retainer contains a piece which is soldered on, ask your dentist or orthodontist whether it is 100% necessary. Usually it is not, and can be removed. Is it OK if you your retainer soaks for longer than 15 or 20 minutes? Can you soak it overnight? We have found that if your retainer does not contain metal solder, soaking longer than 15 to 20 minutes should be fine in most cases and should not harm your oral appliance, even if you leave it soaking overnight. (Most soaking solutions will dissolve metal solder after a period of time). If you're not sure whether your appliance contains metal solder, please ask your dentist or orthodontist. With that said, please be aware that the official manufacturer's instructions recommend that you do not soak your oral appliance longer than 15 to 20 minutes. When in doubt, we suggest that you defer to the manufacturer's instructions. The package is different and I don't understand why it needed to be changed. But anyway, the biggest thing is that the product doesn't turn clear after 15 minutes like it used to. Seems to work the same and does a good job as usual, but it's confusing. Not sure what to make of it. Hey Retainer Brite company, why fix what's not broken??? Merchant Response:Thank you for your review and your concern. The manufacturer changed the packaging at the end of last year. Just recently we were able to put the new photo on our website. Due to new FDA regulations, one minor ingredient in Retainer Brite was changed to make it more environmentally friendly. Depending on the water in your municipality, the product may take as long as 2 hours to change from blue to clear. Your retainer is still clean and germ-free in 15 to 20 minutes, no matter what color the water is. The water color is just a visual indicator to remind you that your device should be removed after 15 to 20 minutes, and does not affect the cleaning efficacy or cleaning time in any way. The manufacturer is aware that the instructions on the new box are not correct, and they plan to update it soon. Please rest assured that the Retainer Brite that you purchased will clean your dental appliance just as well now as it did in the past, no matter the color of the water after 20 minutes. ConsSolution doesn't turn clear after 15 minutes like it used to. Ugly new packaging! Misleading instructions printed on the box says that the water will turn clear when it doesn't! I used to buy this item at Amazon but they don't carry it there anymore. So I found it here. Good item, speedy service. The Retainer Brite is a great product and DentaKit has great prices. The whole process from order to delivery was smooth and easy. Highly recommended. Quick and easy. Always comes out clean. Relatable company with good products & quick service. All good! Have been using this product for over five years. Easy to use, does a great job! Wonderful product. Been using it daily for 26 years. Totally gives my retainers a clean and fresh taste and feel. My son's retainer gets thoroughly cleaned with the fizzy blue bubbles! Tablets are easy to use and get the job done. I just pop the tablet into the water with my retainers and within minutes, the retainers are clean and sparkling again. when it comes to cleaning essix retainers..i highly recommend this product..thanks dentakit! I've been using these for years! Very happy with these tablets! They work great! I have been using these to clean my retainer every day since I got my braces 12 years ago. They are very effective. Product no longer foams up. The tablets don't change the color of the water either. I feel like my retainer just isn't clean. I will not buy this product again. I don't know of a better way to clean a grinding tool. Pop it in the case with a tablet and warm water. 15 minutes later it is clean, fresh and looking good. No discoloring. I ve been using this product for my retainers a couple of years and I am very happy with procduct and how it cleans my retainer. I highly recommend this periodicity. Nicely packaged, product works very well! Have purchased retainer cleaner solutions from DentaKit several times. Always great prices and easy to use website. I have been using Retainer Brite for over a decade. It cleans my bite plate and retainer very well and has never damaged them in any way. Appliances smell minty clean after a short 15 minute soak. The solution used to turn clear, but now remains blue after a soak session. There is no difference in the cleaning despite the lack of a colour change. I trust no other product with the cleaning process of my oral appliances. There is no residue or taste following a cleaning, and there is no tarter deposits in the grooves of my bite plate. It is a great product for gentle, but thorough cleaning of my oral appliances. I am very happy it is shipped to Canada because it cannot be purchased here. Thank you for a wonderful cleaner! ProsCleans very well. No doors left behind and it prevents any build up of tarter in oral appliances. Excellent product! Although the tablets dissolve quickly, the sanitation process, which is completed when the water clarifies, takes about 20 minutes. I was very satisfied, Thanks! I was very satisfied with the product and the service. Thanks! We have night guards from our Dentist. The Retainer Brite tablets keep our night guards cleaner and they smell better as well. We have used these tablets for over a year and have been happy with the results. The horizontal perforations are difficult to find. As a result sometimes the tablets are broken in the process of opening the individual packages. However, that does not detract from the performance of this product which is excellent. These tablets are a great way to clean your retainer without ruining the retainer. Before I used these, my retainer would get dried out from using toothpaste and toothbrush to clean it, and it would crack. Retainer Brite works great! Have used product for two years and find that it is simply the best for keeping retainers clean and bright. I didn't want to spend the money on this so I put it off thinking we could clean the retainers another way. Bad idea. My son was having mysterious belly issues & after he started cleaning his retainers with this, the problems went away. I hate to think what was growing on his retainers. I'm so happy now to know they are clean!!! Thanks for making this. It is great! !